However, Bookwalter is much more than an athlete, just as LeBron James famously declared. He and his wife Jamie run the Bookwalter Binge Gran Fondo, which raises funds for the Southern Appalachian Highlands Conservancy. 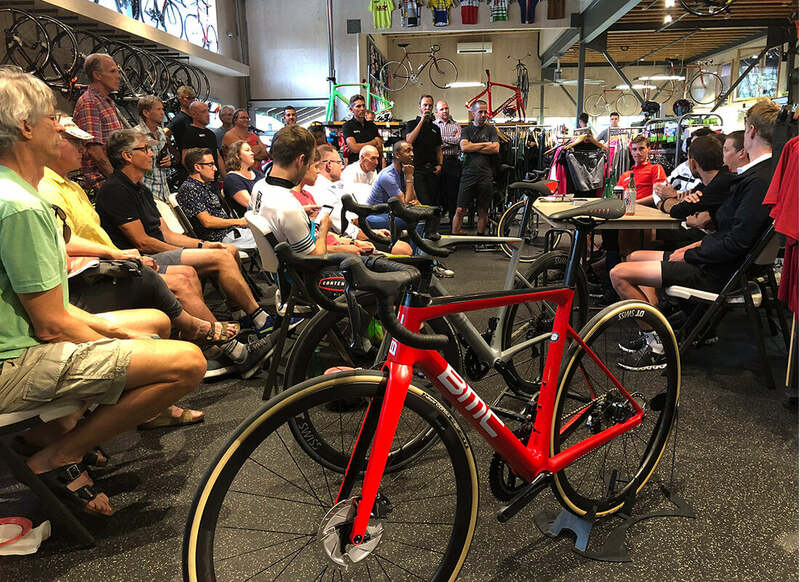 Further, his experience in all levels of cycling has cultivated an interest in bringing cycling to a wider audience, increasing safety within the peloton, and ensuring that pro cyclists have a greater say in how they’re treated. 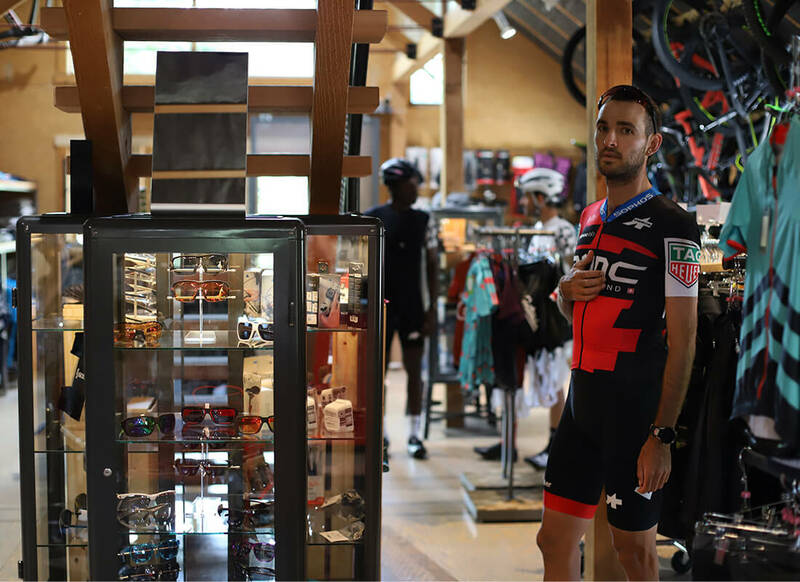 We were fortunate enough to be able to sit down with Brent Bookwalter to discuss his time with BMC Racing, youth cycling, and his proudest achievements in advancing cyclists’ rights in the pro peloton. Alvin Holbrook: The first thing I wanted to talk about was the experience of being on the same team for a decade. If moved around like most other pros, how differently do you think your career would’ve turned out? Brent Bookwalter: Hard to say. This team is a lot different than it was when I first started for riding. When I started with BMC in 2008, it was a much smaller operation, much more American. And that was perfect for me at the time and level I was at. I wasn’t quite ready to jump into an organization like where BMC is at currently. It very much grew, and when I look at the people and the similarities between now and eleven years ago, there are definitely some, and the ones that are there are big ones. I think that’s a large reason why I’ve stayed and why I’ve been able to stay. Over eleven years, you build a sense of trust, loyalty, and commitment. But along with that is a challenge of not becoming stale and outdated. If anytime, if you do anything, or you’re with anyone, for ten years, that’s a long time. And if you’re not finding new ways to spice it up and approach things differently, and create a new value for yourself.. Even if you stay around, you’ll get pushed aside. I’ve definitely had the challenge of not turning into that old parable about the socks. They’re in the drawer, and I like to have them there through good and bad weather, but you always wonder why they’re hanging around. It’s always challenging. I like it. I’m a pretty loyal guy. I grew up in Michigan, the Midwest, kinda simple. I lived at the same place for pretty much all of my childhood, and didn’t have any crazy changes. I think that has a huge influence on me staying here too. AH: Kind of looking about it from everything I’ve seen, I’ve wondered if perhaps the team grew with you, but it seems that it was a partnership, a symbiosis. BB: No doubt we grew together. Like I said, the place I was at in 2008.. If that athlete and that person tried to come to where this organization is now, it would’ve been sink-or-swim tough. I look at some of these young guys that are here now, and I think, “Man, the pressure is high.” But yeah, we grew. Fortunately, I was coming off a really bad injury the year before I came to the team and it wasn’t a high-stakes pressurized power house. But in those two years, we were. 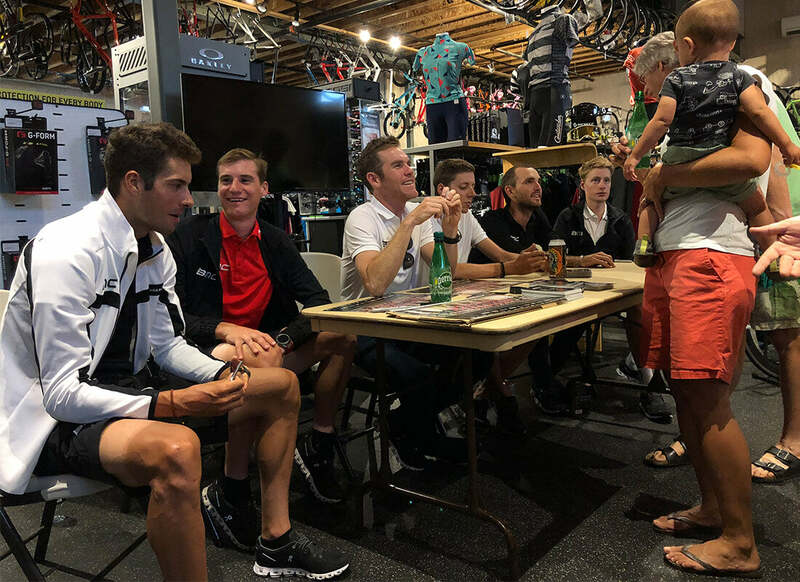 We got big signings like George Hincapie, Cadel (Evans), Manuel (Quinziato), and (Alessandro) Ballan, and that was perfect timing for me. You know, I started a little late. By then I was 25, and that’s the time you have to start stepping up and doing things, getting to the Grand Tours, and carving out a niche for yourself. BB: Yeah! Road racing pretty late. I did mountain biking as a junior, and really didn’t get into road racing until college. I graduated from college after four years, and by then I was 23. That was really the first year where I really wanted to try bike racing full time. Whereas now there are people in the race right now who are 19, 20 years old and doing this full time. They’re maniacs. AH: I sat down with Nate Brown (of EF-Drapac p/b Cannondale), and he had a late start too. He thought that if he started road racing sooner that he would’ve burned out. BB: I think I would’ve too. For me, I have no regrets regarding my path. Collegiate racing was awesome, and it helped me make improvements quickly. I look at some of these guys that are 19, 20 years old, and they’ve already pulled out all of the stops. They’re fully regimed out. They have the coaches, the nutritionist, and all this stuff. What do you do when you need to go to the next level, and pull something else out? When I was fourteen and finishing my first mountain bike races, to 23 (years old) and finally racing road full time, every year there was something else new I could do. It didn’t really slow down. AH: Stemming off of your crash in the 2017 Tour of Britain, you seemed to become much more vocal about cyclist safety, and it seems like your involvement in the ANAPRC (Association of North American Professional Road Cyclists) is part of that. How long have you been part of that group? BB: Good question! It’s been.. Four years now? Four or five years. Really, I started with them when they were getting off the ground. Christian Vande Velde had just retired, and rider’s rights, unionizing, and that sort of thing is something he wanted to put some energy into. He had gotten together with some other guys and got the ball rolling. I think it was that year in the USA Pro Challenge in Colorado, where we had some crazy.. debacles. On the road with strange decisions being made, and us having no outlet to do anything with it. It’s unfortunate that we experienced it, but it motivated us to jump in and get our hands dirty. For one, understanding how this sport works, how the CPA works, how the nations are represented, and how the riders fit in there. Once we understood trying to figure out how we can make the most impactful change and create something that will hopefully improve for future generations. AH: Is there anything you can point to in your eyes, where you like to say, “Yeah, I did that”, or “Yeah, I totally helped contribute to that”? BB: I think that the North Americans have been instrumental in a lot of the small changes we’ve seen over the years in regards to safety. The “weather protocol”, as they call it, is pretty minimal. But it’s something that we as North Americans conceptualized, packaged, and sold to team directors, coaches, and doctors what we thought was an awesome proposal. 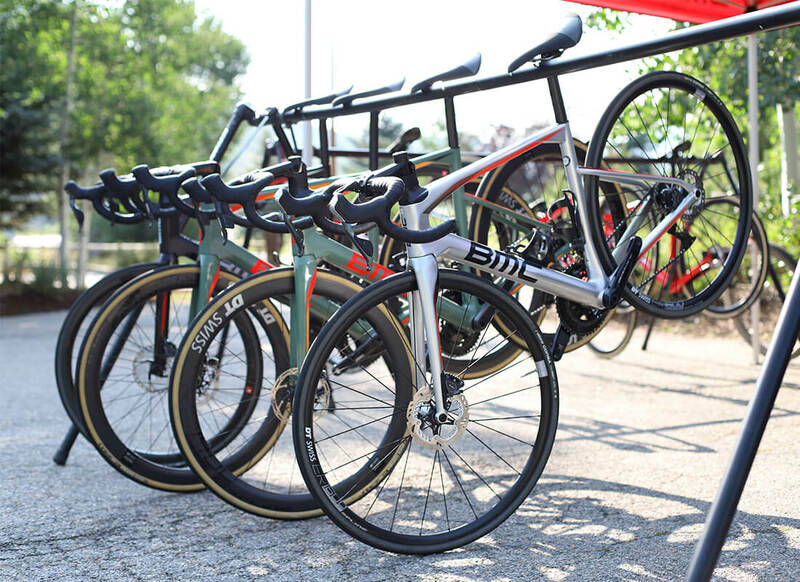 We hand-delivered a solution to the UCI, with all this research, it was plug-and-play. And like any rule, they (the UCI) have a lot of forces to be accountable to, and factors at stake. They chopped off a lot of it, and what we were left with was the Extreme Weather Protocol, and some sort of fundamental ideas. But at least it’s something in a book, and you’re seeing this already affect races, usually in a positive way. There are a few cases where it’s been.. Overutilized a bit. But that’s going to happen with any rule. Historically, the rule structure in cycling has too much human discretion involved. If an official sticks their finger in the air and thinks, “Eh, I’m not having a good day. Race ‘em, or pull ‘em, or fine ‘em.” If we get more tangible criteria in the books, officials can refer back to something that’s simple and well thought-out. But the tough part with that is that it has to be really well-considered, so it’s not at all left to someone’s discretion. I’m really proud of the weather stuff. There’s a lot of reform with regards to the “Three Kilometer Rule”, and we were part of that. We were instrumental in getting other nations and countries into the CPA (Cyclistes Professionnels Associes, or the international cyclists’ union). I think the North American Riders Association was the first nationality or group of riders that had been admitted into the CPA since it’s inception. When the CPA was formed, it was Spain, France, Italy, Belgium, Holland, Portugal.. All of these cycling countries, and that was it! A British guy, an American, Australian, Polish, Austrian, they didn’t have anything. No voice. They could go to their teammates, director of their rider association and petition their cause or something, but that was it. Now, we sort of opened some doors and streamlined the process of getting in. What it took for us was kind of ridiculous. It cost a ton of money, and that is unrealistic. You can’t expect a small country with maybe two professional cyclists like Finland to hire all of these lawyers and go through this process to get in. That’s part of globalizing it, making our voice heard, and establishing ourselves as credible players. Historically, we’re not! You know, we’re the actors in the show; that’s still our primary role in the film, but if we’re going to be those people, we deserve some level of consideration when decisions are being made and they affect our lives and our well-being. AH: I agree about what you said regarding leadership and leaving too much to the discretion of officials in the moment. I see it happen too often in other sports, where refereeing has a lot that is left to them. That doesn’t just change the outcome of a simple game, but perhaps the well-being of the players and massive amounts of people as a whole. To be able to go in and provide a precise protocol is huge. BB: Exactly. Maybe not immediately, but in ten or twenty years down the line it could be huge. We aren’t completely rewriting the book; other players’ unions do it. Hockey does a good job of it. Plenty of sports that aren’t mainstream that do a good job of it. We can do it too, it’ll just take a lot of time and money. It’s a hard group to rally. It’s such an international sport. The way the teams are set up are atypical of a lot of other sports in regards to cultural diversity. But also just the fact that you have thirty guys on a team, and three squads of eight can be racing in different countries at any one time.. There’s no other sport that’s doing that. It’s really hard to get everyone on the same page. AH: Really quickly, regarding the ANAPRC.. What’s next? What’s on the docket? BB: There’s a lot going on right now. Ironically, the issue that’s gotten the most attention with the riders lately has been the prize money debate. Who manages the money? In my opinion, that doesn’t have a huge impact. It’s not ideal the way it is now, but I feel like there are more pressing issues. The leadership for the CPA is up for reelection in January, so that could be potentially a hugely influential topic happening. If Gianni Bugno runs for another, that could be huge. Maybe there are a few other candidates are in the room. We’ll see. But, like always, we need to conduct ourselves like professionals. Not just in a race, but the business world too. In the courtroom, and with marketing, PR, and lawyers, and business professionals.. That’s not who we are. And to get that help, we need money. And, of course everyone is hugely protective of every dollar they make. In other sports, players pay substantial dues and get a lot in return. We set a modest due structure, and that helps fund things. We have corporate sponsors too, but combined that allows us to function as a well-run organization. Other countries are just skimming off prize money, and really you need a combination of both and then some. We have to find a way to get some real hitters in the room. When we go into a room as bike racers, it gets easy for us to be laughed at and not be taken seriously. We have to be more than that. AH: Anything else you want to say? BB: I’m not trying to plug our gran fondo, but I’m going to plug our gran fondo. The Bookwalter Binge, October 27th. A quality group ride that brings about good for the environment and our community. AH: Thanks for your time, Brent.